Prof. Matthew R. Sanders, Ph.D.
Matthew R Sanders is Professor of Clinical Psychology, Director of the Parenting and Family Support Centre at The University of Queensland and Founder of the Triple P – Positive Parenting Program. He has received many competitive grant awards and has published extensively on the nature, causes, prevention and treatment of behavioural and emotional disturbance in children and adolescents. Professor Sanders has received a Distinguished Career Award from the Australian Association for Cognitive Behaviour Therapy and is a Fellow of the Academy of Experimental Criminology as well as of the Australian Psychological Society. The Triple P system has twice won the National Violence Prevention Award from the Commonwealth Heads of Government. 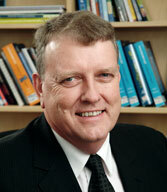 Professor Sanders has served as a consultant for government departments interested in the adoption of evidence-based parenting and family support strategies and has served as a member of the National Illicit Drugs Strategy Community Expert Panel, the Chairperson of the Evaluation Policy Subcommittee for the Board of the National Suicide Prevention Council, a member of the Ministerial Task Force on Work and Family and acts as a Media Spokesperson for the Australian Psychological Society on child and family issues. Prinz, R.J., Sanders, M.R., Shapiro, C., Whitiker, D., Lutzker, J. (in press). The effects of a population level parenting intervention on child maltreatment. Prevention Science. Sanders, M.R. (2008). Triple P-Positive Parenting Program as public health approach to strengthening parenting. Journal of Family Psychology, 22(3), 506-517. Sanders, M.R., Markie-Dadds, C., Rinaldis, M., Firman, D. & Baig, N. (2007). Using household survey data to inform policy decisions regarding the delivery of evidenced-based parenting interventions. Child: Care, Health and Development, 33(6), 768-783. Sanders, M.R. & Prinz, R.J. (2007). Public health approaches to parenting: Ethical and professional issues in the implementation of population-level parenting interventions. Clinical Psychology: Science and Practice. Available online 19 January 2007.